Prepare Now For The New Silver Rush! In 2019 silver may present the opportunity of a lifetime as prices hover near raw production costs; add a supply deficit, a host of rising industrial demand factors as well as rising inflation and you have the makings of a new bull market. Some experts say we have now reached a global threshold of “peak silver” production. Rising demand and falling supply add up to higher prices in the future. 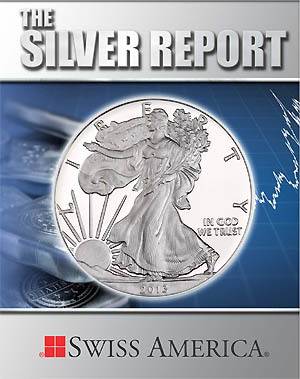 In The Silver Report you will discover the "Ratio Trading Strategy" used in precious metals for hundreds of years as a smart means of increasing metals holding over time - especially during opportunities like today with a distorted Gold-to-Silver ratio. For scores of reasons outlined in Swiss America's The Silver Report, we believe silver will be a win-win asset in the years ahead. Request your free copy of by calling 800-289-2646 or registering HERE.